Ritani Review 2019: Good Engagement Ring and Diamonds? If you're someone who's nervous about buying diamonds from an online retailer, we understand. This is a big purchase involving a type of item where small differences account for large differences in price. Not having the ability to inspect those differences in person can generate a nervous feeling. That's one area where the online diamond retailer Ritani sets itself apart. It allows you to preview your ring in person before you take it home. This helps you make this important purchase with confidence. Read on to see what makes Ritani unique. Ritani uses what the company calls a "clicks-and-bricks" model. They partner with retailers throughout the United States and Canada. When you purchase a Ritani ring online you're able preview it at one of the partnered retailers. Pick out your diamond or design a ring on Ritani's website. Ritani artisans will handcraft your ring in New York and ship it to a local jeweler near you for free. Your credit card secures your preview reservation. Go to your local jeweler to view your ring in person. If you love it, take it home with you that day. If you don't like it, just walk away and your credit card hold is released. Ritani wants its customers to be completely confident in their purchases. That's why they offer this in-store preview for free. There is no obligation to buy. 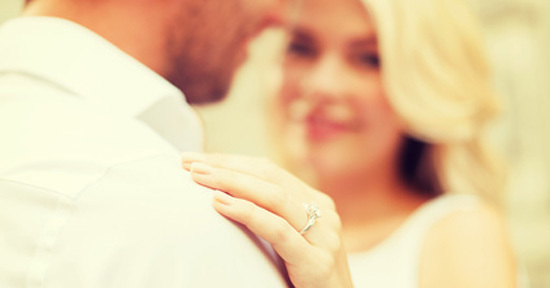 Preview your ring in person at a local partner jeweler. There is no pressure and no obligation to buy. Over 75,000 loose diamonds in all 10 popular shapes (round, princess, cushion, oval, emerald, and others). Loose diamonds are all either GIA or AGS certified. Over 350 engagement ring settings. Styles include solitaire, halo, three-stone, pave, and vintage designs. 5 metal options, including platinum, 18kt and 14kt white gold, 18k yellow gold, and 18k rose gold. Complete bridal sets, weddings rings, and men's wedding bands. Other fine jewelry, including earrings, necklaces, and bracelets. You can also build your own diamond pendant or earrings. Did you know: Ritani, founded in 1999, is based in both New York City (where it creates its own jewelry) and Seattle. You want an in-person inspection. As we already discussed, this "clicks-and-bricks" feature is very unique in the online diamond business. 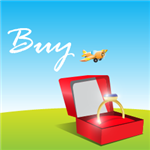 With other online retailers, your only choice is to buy the ring and get it shipped to you. If you don't like it, you'll have to go through the hassle of returning it. You won't need to worry about this hassle with Ritani. You want to create your own ring. You can design your own ring on the Ritani website. You can even select a diamond first and then work your way through creating a setting that will fit with that diamond. The Ritani website makes the process easy and foolproof. Tip: You can save your favorite diamonds and settings for future visits to the Ritani site. Just create an account, and you can then store your favorite options in the My Wish List feature. Sign in again on a return visit, and your product selections will be stored for you to look at again. You want a high-quality setting. Ritani doesn't carry as many settings as some other online jewelry retailers. However, the company prides itself on its craftsmanship. Every ring is handcrafted and made to order in their New York studio. Ritani has made its mark through its ability to create a multitude of unique ring settings. You want an expert opinion. You can select up to four diamonds from Ritani's website, and request a consultation with an expert gemologist. The gemologist will inspect and review the diamonds with you, and provide HD videos and detailed reports. He will help you make the best choice. This is all completely free of charge. You want a well-organized website. Overall, we think you'll like shopping on the Ritani site. The navigation and layout on this site are excellent making it easy for you to find the exact stone you want. Searches are easy, checkout is easy, and customers love the shipping experience. You want a friendly return policy. Among online diamond retailers, Ritani has one of the most customer-friendly return policies. It offers 30-day free returns. As long as you follow all of the rules, you can return your purchase for a full refund. The return shipping is free and there is no restocking fee. Ritani even covers the return insurance. The company can schedule a FedEx pickup, so you don't have to travel anywhere to return the package. Note: Eternity rings and engraved jewelry cannot be returned. You want the lowest price. Ritani has a Diamond Price Match Program. If you see a comparable diamond priced lower at another retailer, Ritani will attempt to match the price. Certain criteria must all be identical, including the certification, 4C's, fluorescence, symmetry, etc. You want a sharp-looking gift box. Part of the ring presentation should include a high-quality gift box. 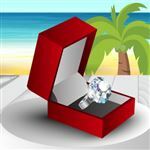 After all, a diamond is a luxury item, and it's important that the gift box showcase that item well. Ritani rings come in an elegant leather box with a gray satin interior. And if you're planning to use this box to propose, it has the classic snap-top shape that will allow you to open it dramatically as you ask that life-changing question. You want lifetime care. Ritani's lifetime cleaning service is outstanding. Because it has partnerships with jewelers all across the US, you don't need to send your ring back for cleaning. Just go to your local Ritani-partnered jeweler for complimentary cleanings. Ritani also offers a lifetime warranty against all manufacturing defects. 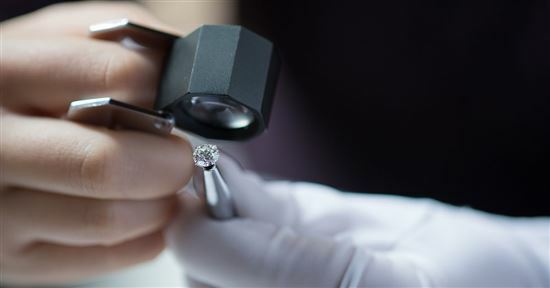 Should you want to trade in an old diamond for a new one down the road, Ritani has a great trade-in policy. You'll receive a 100% credit when you trade in your first diamond, as long as you buy a new diamond that costs at least 50% more than the original diamond's value. You're seeking educational articles. 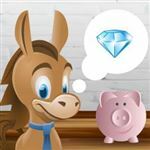 If you want to learn more about diamonds and all the different terminology, you should start with the Credit Donkey series of articles. But if you still want more information after that, Ritani has a very strong educational area that will give you all the basics on shopping for diamonds. Additionally, it contains a section on the latest trends regarding diamond styles. You want lots of HD videos of products. When shopping online for something as expensive and detailed as a diamond, you will want to see an HD video of the individual stone, allowing you to examine it from many different angles. However, Ritani doesn't offer HD videos for as many of its diamonds as we'd like to see. And you cannot filter your search parameters to only look for those diamonds with HD video. Tip: If being able to "see" the diamonds during the shopping process is especially important to you, head on over to James Allen. James Allen provides stunning HD videos of every diamond in its collection. You want lots of high-resolution photos of products. We have the same complaint with the number of the images of stones on the website. We understand that it's certainly a lot of work to create a large library of high resolution images, but we'd sure like to see more of these types of photos available on the Ritani site to allow for extensive inspection of the stones. Not always the lowest prices. Ritani is not known for having the best prices. Their settings are generally more expensive than other retailers'. Some of their stones are priced very competitively, but others are out of line versus competitors. But Ritani does have Diamond Match Price if you find another stone with identical specs. You want the best quality diamond. Ritani has a collection of Reserve Diamonds. These are supposed to be Ritani's super ideal cut diamonds - meaning they have been cut for maximum brilliance. However, these diamonds aren't always impressive enough to justify the higher price tag. Tip: If you're after a top-notch diamond that really shines, check out Whiteflash instead. This online retailer is known for its world-class, super ideal diamonds. 30-day no-questions-asked-return policy. Ritani will also cover the return shipping and insurance costs. You can also ask for a free FedEx pickup. There is no restocking fee. 30-day money back guarantee. Blue Nile will send you a fully insured free shipping label via email. Items must be in their original purchase condition, including all product documentation. Lifetime warranty against on all manufacturing defects. This is applies to rings with the Ritani label, not designer rings Ritani carries. U.S. customers only. Lifetime manufacturer warranty. Terms and exclusions apply. 1 free ring resizing within 1 year of purchase Blue Nile provides complimentary resizing for Build Your Own Rings®, and Diamond Bands when within the manufacturer's recommended sizing range, during the first year. Get 100% credit when you trade in your first diamond. New diamond must costs at least 50% more than the original diamond's value. Diamond must be in original condition with an undamaged grading report. Lifetime diamond upgrade program on all GIA and AGSL graded diamonds. You will receive credit equal to 100% of the original price toward the purchase of a new diamond. The price of your new diamond must be at least twice the price of your original diamond. Your diamond must be in its original condition with the original diamond grading report. 30-day no-questions-asked-return policy. Ritani will also cover the return shipping and insurance costs. You can also ask for a free FedEx pickup. There is no restocking fee. All in-stock diamonds (A CUT ABOVE, Expert Selection and Premium Select) and regular catalogue items are covered by a full 30 day money back guarantee. Diamonds from our Virtual Selection category as well as diamonds and jewelry that may be sourced for you from outside vendors are covered by a 10 day money back guarantee. Lifetime warranty against on all manufacturing defects. This is applies to rings with the Ritani label, not designer rings Ritani carries. U.S. customers only. 1 year service policy. This benefit covers refinishing and repairs to the metals and accent diamonds in your jewelry, that are the result of normal wear or manufacturing defects, for a period of one year from ship date. 1 free ring resizing within 1 year of purchase Rings may be resized once for free within the first year of purchase. Ring designs are limited in their range of sizeability. Eternity rings with diamonds all around are not sizeable. Get 100% credit when you trade in your first diamond. New diamond must costs at least 50% more than the original diamond's value. Diamond must be in original condition with an undamaged grading report. Lifetime Trade Up Guarantee on all diamonds in Whiteflash three in-house categories: A CUT ABOVE®, Expert Selection, and Premium Select. You may trade your qualifying Whiteflash diamond at any time for any other single in-house diamond of equal or greater value. Diamonds must be returned in undamaged condition accompanied by original diamond laboratory certificate. We applaud Ritani's customer-oriented practices. Ritani really sets itself apart with the in-person preview option. This gives shoppers a lot more confidence when making such a huge purchase online. However, Ritani does fall short in their lack of HD videos and photographs. This may make your choice harder. But it does try to make up for it by offering free expert consultation and in-person preview.